It's official! Valentino Rossi has officially lodged an entry to field his own Moto3 team in the 2014 season of the championship. While there have been rumours circulating for months about the fact that Rossi was supposedly going to enter the Moto3 Championship with his own team, the Yamaha rider had insisted early on that there was only a plan to open a VR46 Riders Academy to help promising young riders improve their riding skill. However, now an official entry has been registered with both the FIM and Dorna - VR46 will compete as a team in the 2014 Moto3 season. The VR46 team will be backed by Sky Italia, a move that Rossi hopes will mean that young Italian riders will be able to realise their potential, and in his own words "give the Italian riders the opportunity to be competitive and reach the highest levels". It has also been confirmed that the VR46 Moto3 team will use KTMs in next year's championship. As of now only one rider has been confirmed at the team - Romano Fenati. While we're not sure who Fenati's team-mate will be as of now, rumours indicate that it will be Luca Marini, Rossi's half-brother. Marini is currently placed second in the Italian Moto3 championship. More details on the entries for the 2014 season will only be made available post the Malaysian round of MotoGP. 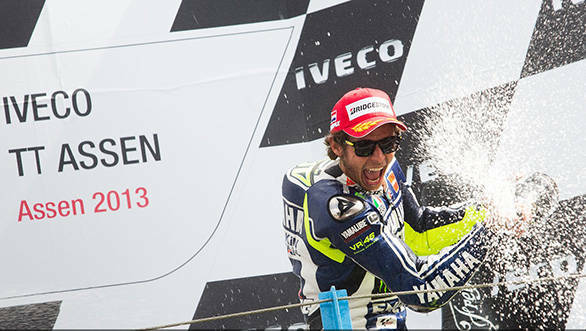 A rider like Valentino Rossi encouraging young guns to make it big in a sport we all like. What's not to like!